Will Consumers Buy The Chevy Volt And Nissan Leaf? In a few months, GM plans to launch its most anticipated vehicle in ages: the Chevy Volt. After years of hype, the Volt will join Nissan's Leaf as the nation's first mass-market electric cars. And everyone in the auto industry will be watching to see what works, what doesn't -- and if America's automotive future is electric. 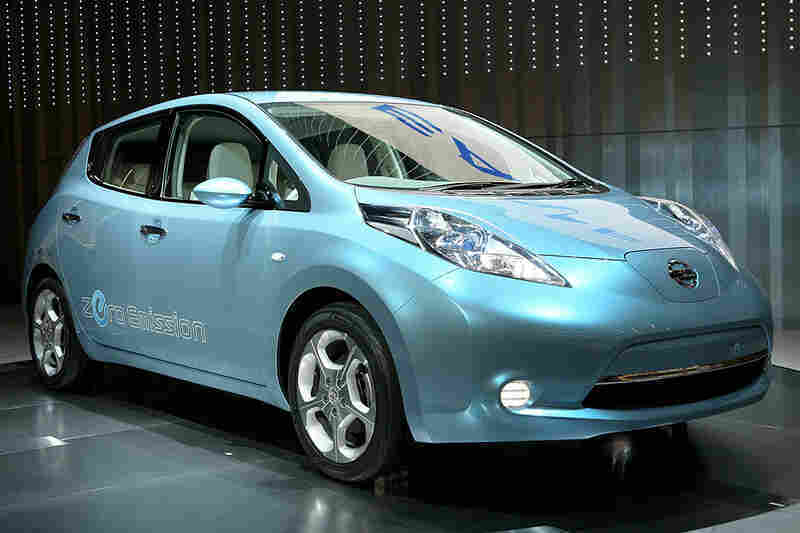 Will Consumers Buy The Chevy Volt And Nissan Leaf? 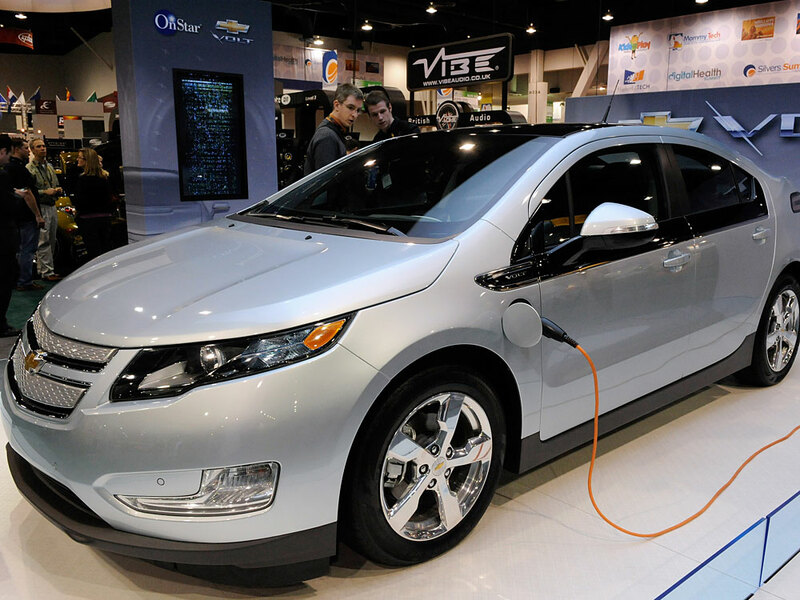 In a few months, GM plans to launch its most anticipated vehicle in ages: the Chevy Volt. After years of hype, the Volt will join Nissan's Leaf as the nation's first mass-market electric cars. The vehicles are dramatically different -- and how consumers will respond, nobody knows. But everyone in the auto industry will be watching to see what works, what doesn't -- and if America's automotive future is electric. When you drive the Chevy Volt, there's a moment when everything changes. You can actually hear when it switches into extended-range mode. I test-drove a Volt around the RFK Stadium parking lot in Washington, D.C., and experienced one of its key selling points. The car can only drive 40 miles on electric battery power, but it also has a gas engine that kicks in -- and, GM says, allows the Volt to go about 300 miles. 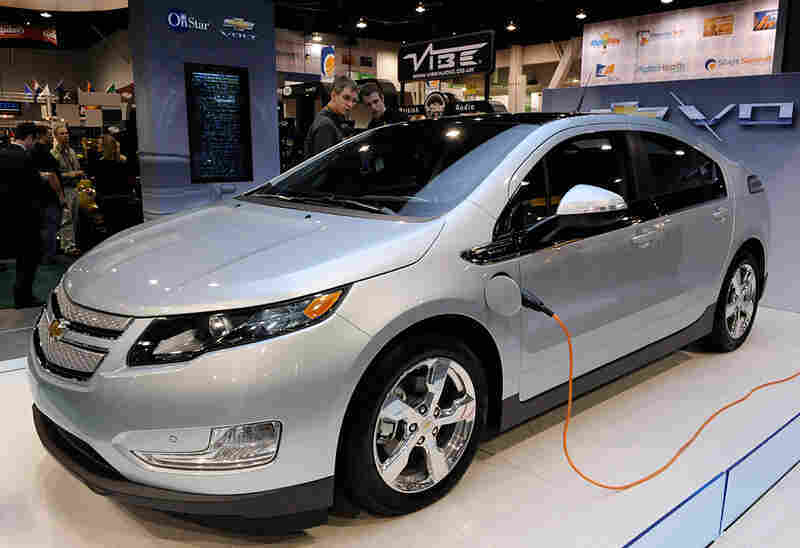 GM says it will launch the Chevy Volt in a few months. It will go for $41,000 -- and owners can apply for up to $7,500 in tax credits. That range is the car's competitive advantage. Many people worry an electric car will run out of juice and strand them. They also wonder about the strength of a battery-powered engine. Just to see, I slammed the accelerator to the floor, and the car took off, reaching nearly 50 miles an hour with surprising speed. GM expects early adopters to snap up the car. It plans to build 10,000 the first year. And -- citing what it called huge interest on its website -- the company is boosting production the following year to 45,000. That's still small by American standards. And after the initial excitement, it's not clear whether ordinary drivers go for the Volt. Bill Visnic, a senior editor at Edmunds' AutoObserver.com, which covers the car business, says cost is going to be an impediment. Like a lot of people, Visnic is concerned about the Volt's whopping price tag: $41,000. Volt owners can apply for up to $7,500 in tax credits. And as Visnic points out, it's a four-seat sedan -- not a large car. For the same money, he says, "you can buy an entry-level Mercedes sedan; you can buy any number of nice Audis." Nissan seems to have an answer for this in the Leaf, a four-door, all-electric hatchback. It's pricing the car $8,000 below the Volt. Mark Perry, head of product planning for Nissan in North America, pitched me the car at the Detroit Auto Show earlier this year. "What you're looking at is a production version of the Nissan Leaf: 100-percent battery, zero-emission vehicle," he said. He says you don't put gasoline in the Leaf -- "there's not even a tailpipe." And on a single charge, Nissan says it can go 100 miles. That's 60 miles miles farther than the Volt. Perry says the difference is the Leaf's more-efficient battery pack. The Leaf is a very green car. But keep in mind: Much of the electricity that will fuel it will come from burning coal, just like the electricity in many American homes. And then there's the question of infrastructure. At the Detroit auto show, U.S. Transportation Secretary Ray LaHood stopped by to look at the Leaf. He pointed out that there's no easy way to charge the Leaf on long trips -- or easy answers for people who live in apartments. "I agree with you. I think this is the next generation for people, but there have to be charging station opportunities for people," he said. LaHood said workplaces and homes are obvious locations for charging stations. "But then I don't know whether it's at malls or rest areas or what," he added. Nissan's Perry said other places could include movie theaters, stadiums and parking garages. But that day is years away. In the meantime, Nissan is bullish. It plans to build 50,000 Leafs in the first 12 months. That's five times what GM plans for the Volt. Then, it's up to consumers to decide.